This essay was written before I discovered that this system had already been proposed years before by someone else. They named the system Demarchy. My system is slightly different because it is designed to replace elections in a large democracy, while the original proponents of Demarchy envisaged it almost exclusively for small communities and implied a move away from centralised government. I call my system Demarchy too, but it is more accurate to call it Klerostocracy (kleros = Ancient Greek for throwing lots... ie random selection). In our modern democracy today, we rely heavily upon a system that requires people to vote for which person or party they think will do the best job. This democratic system has been in place for centuries and there is no doubt that it is a superior governing model to the various monarchies, dictatorships and feudal systems of years past. Giving people the right to vote is seen as a civil rights issue, and much sweat and blood has been spilled over giving women the vote, as well as racial minorities like African Americans in the USA. Despite all this, I believe that our political system is fatally flawed, and this flaw is based upon the very thing that gives us the impression of democracy - the individual's choice of who to vote for, or which political party to vote for. In this paper, I will not only argue that the modern democratic system is flawed and ultimately destructive, but that a better model be adopted by democratic nations the world over - the Random Representation model. So firstly, what is wrong with our current model? We need to remember that those who fought for democracy and freedom in its early days honestly believed that it was the best and only viable model at the time. In this belief they were correct. The problem is that because democratic government relies upon elections, voters are more likely to vote for whichever person or party appeals to them the most. This may not seem problematic, but it is. It means that politicans and political parties are more likely to lie and decieve the voting population in order to gain votes. And when these lies are exposed after the election, it does not do the damage it should for that particular party because, by the time of the next election, people have forgotten or no longer care. In this sense, political parties are the same as rival companies who advertise their particular product. Advertising is not about truth or objectivity, it is about feelings, it is about impressions, it is about image. The fact that we have people who rely upon impressions and misleading information who make important decisions about our nation is a huge problem. The second thing wrong with our current model is that those in political power are easily corrupted by those who wield other power in our society. It is no secret to say that, in Australia, the Liberal party is funded and controlled by big business, while the Labor party is funded and controlled by trade unions. the same can be said for the Republican and Democratic parties in the USA, and the Conservatives and Labor party in the UK. The fact is that money talks in our society, and big business wants to have sympathetic politicians in their pocket. They do this by granting huge donations to the political party to enable them to have the resources to advertise to the people and make them vote for them. Big business have also managed to keep the left-wing parties under their control through their checkbooks - by appearing to be non-partisan, big business funds both sides of politics, but what you have is two sides of the same coin. The same can be said for unions and the left wing parties, although they have far less monetary power than big business. The result of this situation is that politicans are controlled by minority groups in our country that have enormous monetary or social power. Our politicans today would not be influenced by these groups if they didn't rely upon a voting system. The third thing wrong with our current model is that, because politicans worry about feelings and impressions and are funded by minority groups, they do not make intelligent long-term decisions. Instead, they will make decisions that are politically expedient at the time, and ensure that they remain electable next time an election occurs. An example of this might be a huge tax cut announced before an election, which rests upon that party's remaining in office. People think that would be a great idea, vote for them, and for the next decade have to deal with a rising and debilitating fiscal situation that requires drastic cuts to government services to control. What we have are short-term gains that are more than offset by long term pain. Many European governments, I believe, are suffering fiscally and with high levels of unemployment that can be traced back to unintelligent fiscal policy based upon political expediency. The fourth thing wrong with our system is that it promotes the politics of aggression and hatred. All Australians are sick of question time, where politicans get up and deride the other party publically. The fact is that the people who run our nation are not rewarded for working together, they are not rewarded for praising the other side of politics, they are not rewarded for being kind and gentle to one another. If we wish to have a society based on trust and friendship, why are our elected representatives so aggressive? So long as our political system remains adversarial, so will our society. The fifth and last thing wrong with our system is that, when you draw all these points together, is a system that does not reward the honest, hard-working. courageous and intelligent person who wishes to enter politics, but rewards the most selfish, conniving, self-seeking person. Altrusim has no place in politics, yet we as voters want our politicians to make the best decisions for our nation, rather than the best decisions for themselves and their political party. One of the great ironies of our system is that despite all these rewards for bad behaviour, there are politicians who genuinely do want to make a difference, who are courageous and honest. But these are in the minority, and they may have to sacrifice their political position in order to remain true to their beliefs - a situation that may force them out of politics, or to renege on their beliefs. There is no doubt that our current system is flawed, but it is so much better than having a dictatorship or a feudal system. But we need to remember that our current system is not actually democratic, because corporations and powerful interest groups keep our elected officials on their payroll. In many ways, we live in a corporate state. We do not live in a democracy, we live in a monetocracy posing as a democracy. So what is the solution? Hopefully what I've outlined to you is nothing you haven't heard before. You all may have known of these problems for many years but what solution can there be? Proportional democracy maybe? It could work, but remember that whenever people become career politicians they have to be dependent upon donations, which come from minority groups in society. The problem is still there. My solution is radical, and I'm sure someone has thought of this idea before - if they have I haven't read about it or studied it. So what I'm proposing to you today is my own idea, even if it may not be totally original. The democratic system I propose is called "Random Representation". It does away with the electoral process of voting but does not do away with democracy. It will do away with the career politician and, I'm afraid, will do away with virtually all political parties. This is not really as big a problem as you might think, since special interest groups and lobby groups will have some influence over government policy. The good thing is that these interest groups will have to work on intellectual persuasion rather than monetary influence - although one can never rule out bribery. The proposal is this. Rather than electing our politicians via the ballot box, we determine how many politicans we need and select them randomly from society. How? We can do it via a random number generator from a computer or we can draw ballots from a ballot box. Either way, our politicians will be randomly selected. When these people become our politicians, they then have a four year term of office, and are then obliged to stand down as a new random selection occurs. If any of them are lucky enough to be selected again (akin to winning the lottery twice) then they can serve again - however the chances of this are remote. The randomly selected politician has an advantage over the current system firstly because they are less likely to be corrupted by special interest groups. In order to rise to the top of politics, career politicians have to be in bed with these special interest groups over a long period of time. A randomly selected politician is much less likely to have these relationships. When they make their political decisions, they do so with less personal interests at stake. The second advantage of the random politician is that only having four years in the job, they will not be making short-term politically motivated decisions. They will know that their time in politics is short and they should do the best they can while they are there, which will involve a more balanced and objective analysis of important issues, as well as a desire to learn issues while they serve. This means that any decision they make is likely to be made from honest convictions - they might still be wrong, but at least they had no hidden agendas. The third advantage of the random politician is that the desire for aggression and disagreement with other politicians is lessened. I'm not suggesting that this new breed of politician will always be nice to each other, but we need to realise that the structures that cause division and aggression in our current political system will no longer be around. This means that the politicians will disagree with each other more politely, or at least with less of their personal interests at stake. After all, their performance in parliament is not going to keep them elected is it? This system will reward consensus and objectivity rather than back-room deals and political conniving. The fourth advantage is that the entire system rewards the politician who is open, honest, objective and altruistic - simply because it is does not reward the politician who lies and who makes decisions based upon personal gain or toeing the party line. Now what I've given you is a bare bones explanation. What I'm going to do now is answer some of the questions you have before you even ask them. Namely, how will the random selection process work when you want the best type of person for the job? and how will this system fit in with our current parliamentary system? First question. Although I have stated that the selection will be random, I am not suggesting that just anyone can enter politics as though they have won lotto. I believe that those who are randomly selected should meet a certain criteria. In other words, we only select from the pool of the best people in Australia. Now this in itself is controversial. What is this criteria? If the criteria is too broad, then we can get all sorts of weirdos and half-wits to run our country. If the criteria is too narrow, then we lose the ability of the random system to represent Australians. So what is the solution to this? The first thing they should have is a university degree awarded by a recognised tertiary institution. This does not have to be an Australian University, but it does have to be a degree. Why should this be compulsary, after all it is surely elitist and too narrow a criteria? I believe that those who run the country should have had the opportunity to develop their intellect at university, and have passed all the requirements of a degree. We need intelligent people running our country. This is not to suggest tha non graduates are stupid, but it does recognise that the position of politician is a professional position, and requires a level of intellectual competence. The only way to broaden this criteria is to increase the amount of university graduates - which means we should have a better education system as a result. I am certainly in favour if this. The second thing they should have is some recognised study into many facets of learning that will enable them to at least understand the different issues facing political decision makers. So while I'm saying they should have a degree, I'm also saying that at least part of their education should be well-rounded to incorporate all sorts of different areas. I've thought of around ten areas that these people should be competent in. They should have an understanding of Economics and Accounting (to fit into the right hand side of politics), they should have an understanding of Aboriginality and Socialism (to fit into the left side of politics), and they should have an understanding of Mathematics, History, some form of Religious studies, English literature, Environmental Science and Legal studies (that all fit into a more neutral part of politics). Ideally I would like all of these areas to be studied at the level of a university subject, but, if not, then they should be of a greater standard than you find in the final year of high school. There are probably more subjects that can be studied, but these are the ones I think are pretty important at the moment. The third thing they should have is that they be fluent in a language other than English. Many politicians in non-English speaking countries have made the effort to learn English, so why shouldn't we learn one of their languages? Why should this be a criteria? Our politicians will have to make decisions about other nations, and the ability to speak a foreign language will obviously enable some to relate more directly and personally to representatives of other nations. But it will also enable our politicians to have some level of knowledge about another nation, thus giving them a different perspective to our own limited one. The fourth thing they should have is Australian Citizenship and, if they have become Australian citizens after migrating to Australia, have been naturalised for a decent period of time - say 15 or even 20 years. This criteria will ensure that Australians or long-term migrants will be our politicians. It also goes without saying that anyone convicted of a serious indictable offense cannot be considered as a politician, even if they meet the other criteria. The most obvious problem with this is, who meets the criteria? Not many people at the moment. That is why it is important to promote it. University courses should include the study of some or all of the broad areas I mentioned above - Mathematics, English, Aboriginality and so on - as part of the award for their degree. Professional bodies such as the Institute of Engineers, Chartered Accountants, Medical Fellowships and others should also include the meeting of the criteria as essential to membership. All nurses and teachers should fit the criteria as well. I suppose my argument is that if more and more people fit into this criteria, then we will actually have a better and more informed society, not to mention a greater pool of people to randomly select politicians from. For this to work there needs to be a generous influx of economic resources in important areas, namely basic education at primary and secondary level. In the meantime what can work is that the selection criteria be broader at the beginning (taking away the need for a second language and the broad knowledge base, but still requiring a university degree) and then made narrower as more people begin to fit the criteria. In terms of gender balance, the random selection should ensure more female representation in parliament, though this will obviously be determined by whether there is a gender imbalance in those who fit the criteria. People from a non-English speaking background will also be adequately represented since they already fit one part of the criteria. Aboriginal and Torres Strait Islander representation will not reflect their position in society because their low socioeconomic status will ensure that they find it more difficult to meet the criteria. I do not believe we should have special requirements that let people in on the basis of their race or their skin colour, mainly because it doesn't address the problem of why they can't meet the criteria in the first place - namely, that more educational and health resources need to be spent to ensure that they are able to make it on merit. One more thing before I move on. People who fit the criteria should probably be rewarded with some form of public recognition and even having letters after your name, Member of the Australian Representative Body, M.A.R.B. or something like that. It would look good on resumes and confer some amount of respectability upon such people. Alright, how can Random Representation fit into the current Australian Parliamentary system? How about listening to my fastasy first. My own preference is for a unicameral system based on a proportional random representation alongside a president as head of state. This would mean the merging of both Senate and House of Representatives into one representative body. I'd like a relatively small amount of representatives, say 101 people to make all the decisions and create all the bills. The President will not be elected by the people of Australia, but by the Representative Council, who, after their four years in office, elect one of their own members to serve as President for four years after that. In other words, the president will be a former member of the Representative council, who will be signing the bills presented to him by the council that replaced the one he was a part of. We get rid of state governments, and merge a few local government areas, who use exactly the same random representation model except that people who are residents of the local area will form the pool of representatives that can be randomly drawn from. So that's my model. I like it. It seems simple, but obviously needs a lot more work. What about our system now? We must remember that the House of Representatives currently offers the clearest representation of the nation, while the Senate confers equal power to the States, regardless of how many people there are in them. Many people have bemoaned the fact that NSW and Tasmania have exactly the same power in the Senate, despite the fact that Tasmania has a much smaller population base. As far as my memory of Australian history informs me, the reason why the Senate is what it is is because each state was given some form of individual right to ensure that they are not swamped by the numerical power of other states. It has something to do with the rights of individual states as part of the constitution. The system can work as follows. Both House of Reps and Senate appoint their members as per the random representation model. There are no more geographically based "seats" in Parliment, instead the lower house draws its members randomly from the entire Australian Population. The Senate is similar, except that it draws its members equally from each state. Say, ten people from NSW, ten people from Tasmania, and so on. The governor-general is appointed at the end of their four-year term from one of the members of the Senate or House of Reps, and is elected jointly by both houses as their final decision before they are all replaced by new representatives. State governments can work exactly the same, as can local governments. Rather than people voting for people, people who meet the basic criteria are randomly selected to serve a four year term. One variation I can live with is that representatives are appointed every year to serve a four year term. This means that at the end of each year, one quarter of the representatives retire and are replaced by new people. In the election of the governor-general, his or her selection will only be determined by a successful completion of four years as a representative, no matter how many years difference there has been between their completion of parliamentary service and their appointment to the office. For example, a man has finished his four year term of office and was generally liked and admired by all he served with. Unfortunately, the office of Goveror-General has another 2 years to run. He spends two years out of parliament, but is then elected by Parliament as the new Governor-General when the other one steps down. So, what place is there for influence in the system? Apart from the death of political parties, it will ensure that single-issue entities form lobby groups to try to influence representatives. You can be assured that the Housing Industry Association, people representing the Australian Stock Exchange, people representing big businesses like Microsoft, will all have their people in Canberra ready to influence these random selected politicians. But groups like Greenpeace, Amnesty International and others will as well. And because these politicians have not been directly influenced by these entities (although they may be indirectly influenced by propaganda and advertising) they are more likely to make objective and selfless decisions than our current politicians. I well realise that this system is not perfect either. One skill that politicians have is the art of compromise, and there may be some randomly selected representatives who do not have that skill. I am also sure that a lack of experience in government will also affect decisions. However I do believe that the system of Random Representation is a far more democratic and workable governmental system than the system we have been running now for years. It will be revolutionary, and I believe that it will change the way individuals in our country perceive politics and government. For once we will have relatively honest and intelligent politicians. This work is licensed under the Creative Commons Attribution-NoDerivs License. To view a copy of this license, visit http://creativecommons.org/licenses/by-nd/2.5/ or send a letter to Creative Commons, 559 Nathan Abbott Way, Stanford, California 94305, USA. * To copy, distribute, display and perform this work. * To make commercial use of this work. * By attribution. You must give the original author credit. * No derivative works. You may not alter, transform or build upon the work. * You may remove the "Department name" from the text when copying. * You may Americanise any minor spelling (eg Humour, Humor). Billy Graham "will repent on death bed"
To safeguard our freedom, we must destroy it. Killing in the name of...? The European Union - A Force for Peace? Pink Floyd "Echoes" and "2001: A Space Odyssey"
Why I almost cried during "The Incredibles"
What would the real Christian Church look like? 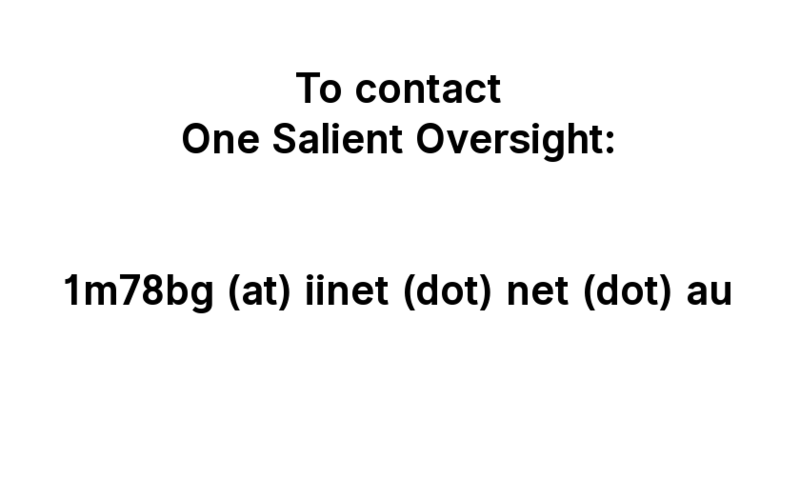 "One Salient Oversight" - why the name?